Neck pain relief is highly sought after in this day and age. Most of us tend to carry all our stress and worries in our shoulders and neck. While acupuncture and massage are great neck pain relief therapies, these simple exercises for neck pain are essential for true healing and complete recovery from neck injuries such as whiplash, head injuries, and post traumatic stress disorder plus many others. All of these exercises should be done gently and with extreme care, as to not aggravate your condition. You can request personal instruction by going to my Contact Page and filling out my Contact form with a message for further instruction. "Pointing your Horns to the Sky"
With feet shoulder width apart and your hands on your hips, shift your head laterally to the left and point the left upper corner of your head (where your horns would be if you were a deer) diagonally left and up towards the sky. You should feel a stretch in the left side of your skull. Return to center. Now repeat to the right side, pointing the right "horn" diagonally up and to the right, stretching the right side of the skull. REPEAT 3 TIMES to each side. This exercise loosens constrictions between the C1 and C2 cervical vertebra by the lateral stretching. "Drawing a Figure 8 with the Top of your Head"
Tilt your head down so that your chin touches your chest. 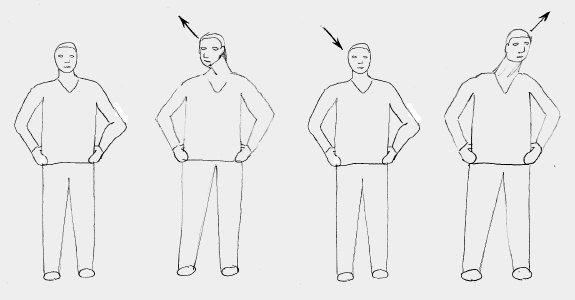 Now turn your head to the left, then tilt your chin up, next bend your neck so that your right ear tilts towards your chest. You are basically looking to the left and then tilting your head to the right, which is now your front. Turn your chin back to straight and down towards your chest again. 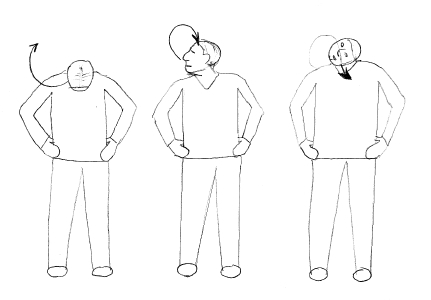 Now turn your chin to the right, then up, now bend your left ear down towards your chest. You are drawing a "Figure 8" with the top most point of your head. The 'Crown Chakra' or acupuncture point 'Bai Hui' which means '100 meeting point' which means that everything in your body connects at this point. 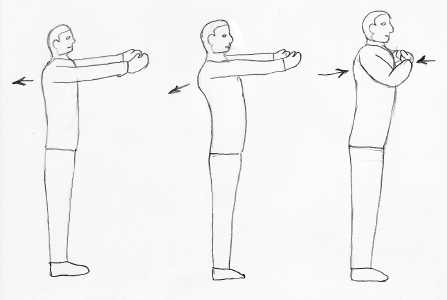 Make sure to do this exercise slowly and without any over tensing of the neck muscles and no jerky motions. This movement should be slow, smooth and fluid. REPEAT THIS ENTIRE SEQUENCE 3 TIMES so that you draw three full "Figure 8's"
This exercise loosens constrictions among the C3, C4, and C5 cervical vertebra. 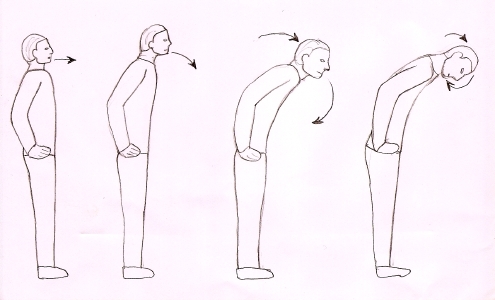 "The Turtle Extend its Neck"
With your hands still on your hips, point your chin forward, allowing your neck and upper body to follow by leaning forward, keeping your chin pointing up slightly. Now tilt your chin downwards tucking it into your chest. Keeping your chin tucked into your chest, straighten your vertebra one by one, unraveling them in a slow and fluid motion. When you start straightening your cervical vertebra, open your jaw wide in order to loosen to cervico-tendino-muscular joint junction. Many neck disorders have a concurrent TMJ jaw tightness issue. REPEAT 3, 5, or 7 times. You should feel a stretch in your upper thoracics up into your cervical vertebra. This loosens the T5 thoracic vertebra through the C6 and C7 cervical vertebra. "The Crane Flaps its Wings"
With feet shoulder width apart, lean forward from your waist. 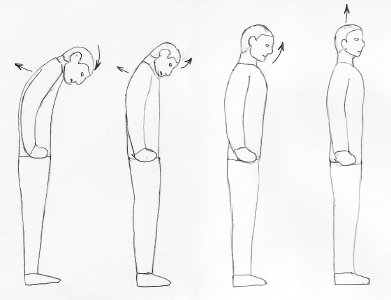 At the same time, your arms circle back, to the side, and then forward overhead as you lean all the way forward so that your back is parallel with the floor. Straighten back up, leaning back, arching your back, and then spring your chest forward to meet your hands, which are now pointing at the center of your chest. This movement should feel like you are cracking a whip, and the whip is your spine. Your spine bends forward, then back, arching your back, and then front again. You should feel the "crack of the whip" when you spring your chest forward at the very end of the movement. This movement unlocks and loosens all of the Thoracic vertebra as well as the sternum and all of the rib attachments in the front and back of your chest. It really opens the "Heart Chakra" and benefits all of the muscles that support the cervical spine.